Designed by creative firm Matchbox Studio, the piece features four case studies of brands in the health and wellness markets. 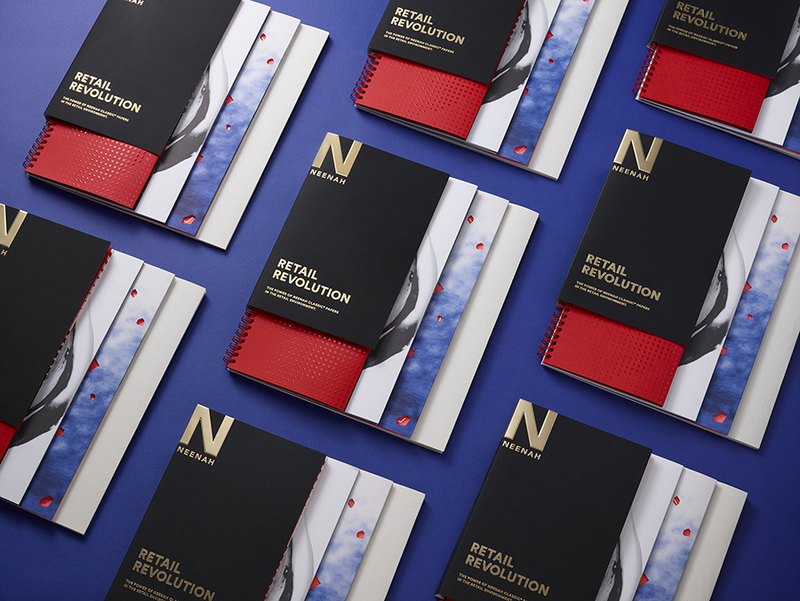 Thoughtfully designed print collateral demonstrates ways to get customers in the door, engage and excite customer’s in-store, help spread the word, and help brands build a following. 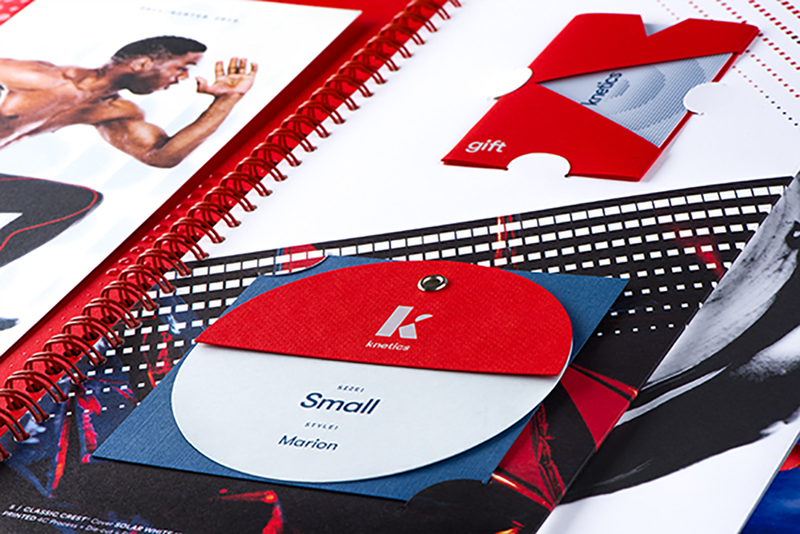 Each brand features samples produced on CLASSIC® Papers. Whether your store is brick and mortar, online or both, you need traffic to make sales and giving them a reason to visit is the first step. For retailers, this means creating a memorable in-store experience. 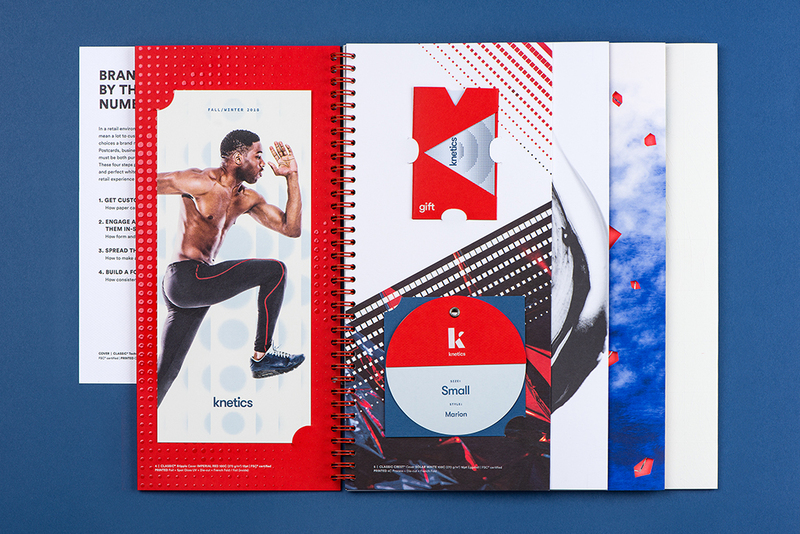 The first case study focuses on apparel Knetics, a dynamic athletic brand. They highlight the use of an oversized postcard and gift card in a creative die-cut carrier to grab the consumer’s attention. And talk about details! A grommeted hangtag combines three different shapes, three different papers and movement to deliver this brand’s active messaging. 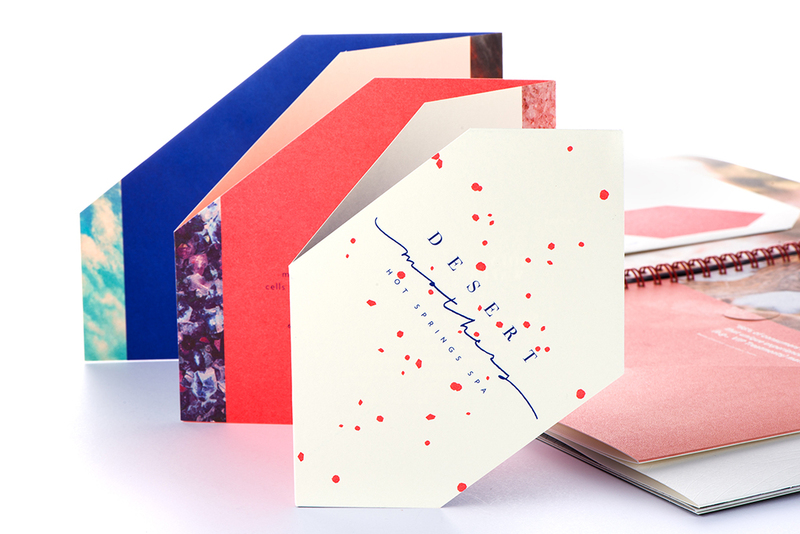 These pieces are produced using highly tactile finishes or brightly colored shades of CLASSIC® papers – the postcard on the subtly toothy of CLASSIC CREST® Eggshell, the gift card pops in a Classic Crest Imperial Red card holder and the hangtag uses both color and texture – produced on a combination of CLASSIC® Techweave, CLASSIC CREST® and CLASSIC® Linen. Once you have traffic, it’s important to keep the customer engaged. Once of the most effective ways to do this is through point of purchase display and packaging. Focusing on the skincare segment, Pack Apothecary is a men’s line of products. Using tactile papers in a monochromatic color palette, the point of purchase materials feature common brand identity elements one would find in any spa or salon. Produced on CLASSIC COLUMNS® Duplex Charcoal/Recycled 100 Bright White and CLASSIC CREST® Cool Gray. 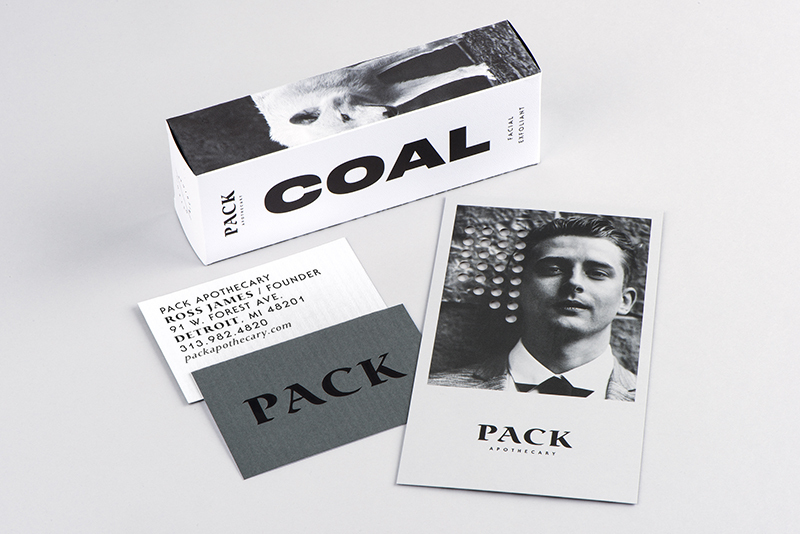 This brand sample includes a box for its coal facial exfoliant. Note the clever use of texture with CLASSIC® Stipple to suggest the product within. The fastest way to build brand loyalists is by making them feel like they’re a part of something special. 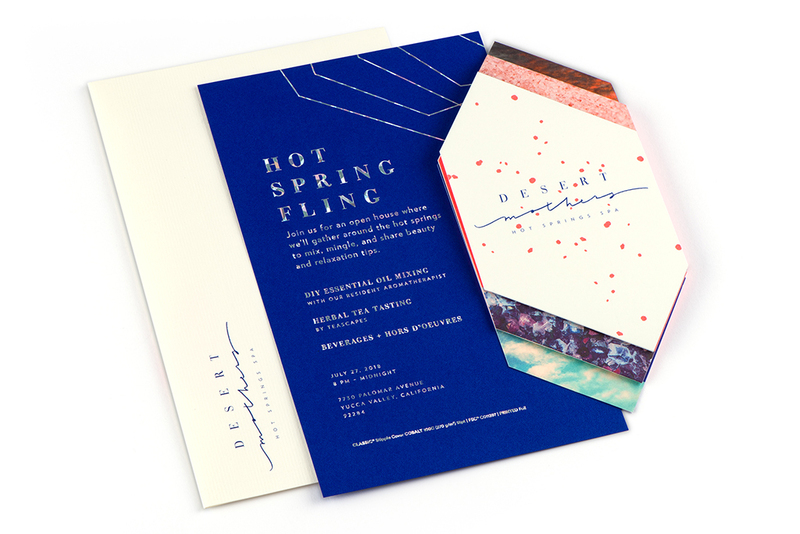 By pairing rich, tactile papers with production details, print collateral translates into sensory experiences. Focusing on the custom experiences resorts offer, Desert Mothers Spa appeals to the desire to combine decadence with spirit, mind and body wellness. The invitation pairs the vibrant color and texture of CLASSIC® Stipple with a luxe holographic foil stamp, produced in an oversized format with complementary envelope. The brochure is a geometric, accordion fold that uses the appeal of natural visuals with the texture of CLASSIC CREST® Classic Natural White. Nothing connects with new followers like the discovery of a brand that feels was crafted just for you. Online retailers and subscription services use curated personalized print to reflect the quality of their product. As a subscription service business for the graphic design community, Parse & Parcel does exactly that. 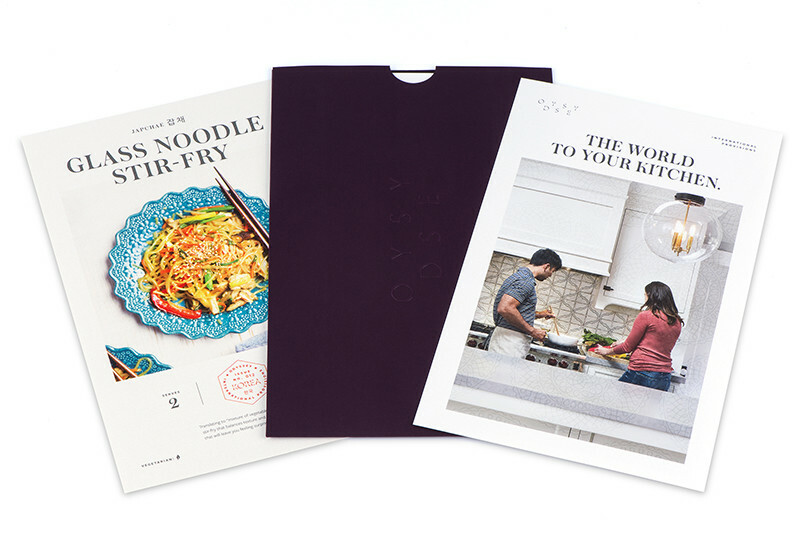 Focusing on food subscription services as inspiration, Odyssey delivers on the luxury side of the home meal kit trend. The pairing of CLASSIC® Linen, photography and blind embossing create an elegant presentation. The promotion is peppered with powerful stats about the use of paper, print and design to create measurable ROI. And that’s a message retailers and marketers alike understand the importance of. 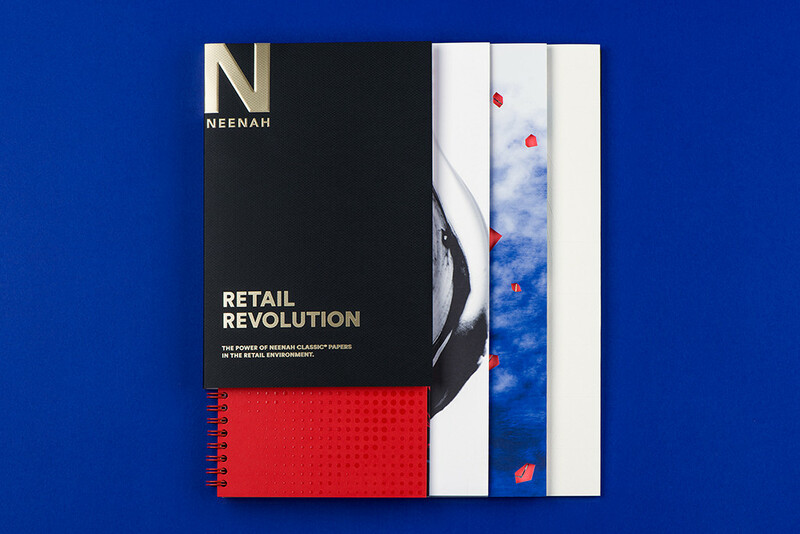 Leave it to Neenah to inspire a revolution – a CLASSIC® Retail Revolution.